When you have a family, doing laundry plays a major role in your weekly routine. Depending on the size of your household, you can be doing laundry a couple times a week to keep from being overloaded on the weekend. Washing machines designed and built prior to the year 2011 use about 40 gallons of water per load. Newer, energy and water efficient models use about 15 gallons per load, so if you can afford to upgrade to a one of these models, you can save your family a great deal of money. While you are saving up for a new washer or deciding whether or not it’s time to invest in a newer, energy and water efficient model, here are a few tips to help you save water. Don’t wash towels daily. The towels used after a bath or showers don’t need to be washed daily. Hang them up after using them so they can be reused. Always wash a full load. Instead of washing small loads, save them up to run full-sized loads to save water and energy. Don’t wash in hot water. Use warm or cold water to wash clothes since heating the water for a hot wash cycle wastes a lot of water and energy. Use load sizes when washing clothes. If you must wash a small load, make sure you adjust the load size prior to starting the cycle to conserve water. Most new, energy efficient washers will automatically adjust the load size for you so you don’t have to worry about it. We all know how important it is for a family to have clean clothes on a daily basis. If you are willing to implement some of the steps above, you will not only save on your monthly water bill, you will also be saving money on your monthly gas or electric bills. Washing in cold water saves energy and lowers your energy utility bills but does not save water. Use less detergent or the appropriate “HE” clothes washing detergent, if directed by the manufacturer. Replacing your old clothes washer with a new high-efficiency model can save water – lots of water. 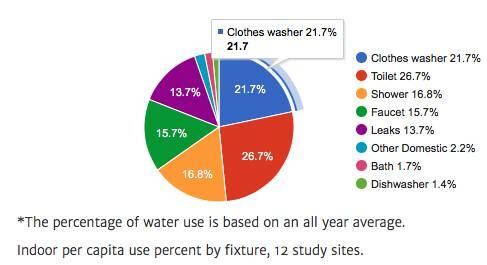 Clothes washing is typically the second largest user of water indoors after toilet flushing. A recent study conducted in Seattle measured water use in single-family homes before and after installation of high efficiency clothes washers. Three different makes and models of clothes washer were tested and all three saved water and all three received high satisfaction ratings from the study participants. Most major manufacturers now offer at least one high-efficiency model. What happens when a family of four replaces their old clothes washer with new high efficiency model. Figure 1 shows a projection of the difference in water use for the non-conserving homes. The family would save more than 8,000 gallons of water per year by installing a high efficiency clothes washer. Many of these machines will also reduce energy consumption by using less hot water and because they feature higher spin speeds and hence the clothes come out of the washer with a lower moisture content and require less drying time. In many places you are charged for wastewater based on the amount of water used. In some areas, wastewater charges are higher than water rates! Replacing your old clothes washer with a new high-efficiency model can save money on your wastewater bill in addition to your water bill. If wastewater is billed based on your water consumption, any water efficiency you achieve will also reduce your wastewater bill.